The Billikens did exactly what they needed to do this week, downing Butler at home in decisive fashion. Javon Bess and co. kept the Bulldogs’ leading scorer Baldwin in check all night, and Travis Ford got his second resume-building win of the season. Saint Louis is looking pretty good right now. True non-conference road tests have proved to be trap games in years past for the Wildcats, but not this year. UNC Wilmington put up one heck of a fight, but the 1-2 punch of Kellan Grady and Jon Axel Gudmundsson played beautifully down the stretch to deliver the victory on the road. Dayton missed out on a crucial opportunity at home this week against Mississippi St. The Flyers were up 8 late in the first half before the Weatherspoon brothers hit some key shots late that would put Dayton away for good. Dayton has a win over Butler and no bad losses but few good non-conference opportunities remaining. A road date with Auburn will undoubtedly be the toughest test of the season. After leading by nearly 20 in the first half against Old Dominion, the Rams succumbed to a second half surge from the Monarchs and failed to respond, leading to a 10 point loss. VCU would bounce back against Iona, but the grunt of the schedule remains: true road tests against Texas and Virginia are up next. Saint Joseph’s stays at #5 despite a disappointing week. The Hawks’ second half woes have been difficult to overcome, and it proved to be true as Temple stormed back and took one in Hawk Hill this past weekend. SJU’s at-large hopes are pretty much out the door at this point. Defense needs to pick it up. Credit the Dukes for sticking around with Pittsburgh in the City Game, but the Panthers were too much to handle in the second half. This team certainly has the parts and is moving in the right direction; it still feels like it’s a year away. However, this year has shown promise already, and you have to be happy with the way Keith Dambrot is moving the program along if you’re a Duquesne fan. Shooting woes continue for the Rams who are now just 20.8% as a team from three on the year (that ranks 352nd in the nation). It’s obvious that URI needs a shooting threat at this point, but I’m not sure who will step up. Neither Russell or Dowtin are shooting better than 20% from long range this year. I think this is a team that’s on the come up, and if you look at the Minutemen’s resume (minus the Howard loss), it doesn’t look horrible. This week will prove to be a great test, as Massachusetts plays host to a decent Holy Cross team and travels on the road to face Providence. Credit the Patriots. A road win over William & Mary was an unexpected but pleasant victory for the team and the league. Beating Vermont at home today would go a long way for this team right now. With Stockard back in the lineup, it seems the Bonnies have started to find their stride and look like a completely different team. That said, the schedule is about to get a lot more difficult. Buffalo, Vermont, Northeastern, and Syracuse will all be tough games. SBU would love to get at least one of those. Nick Sherod went down with an injury, and oddly enough, the Spiders respond and look even better than they did before. 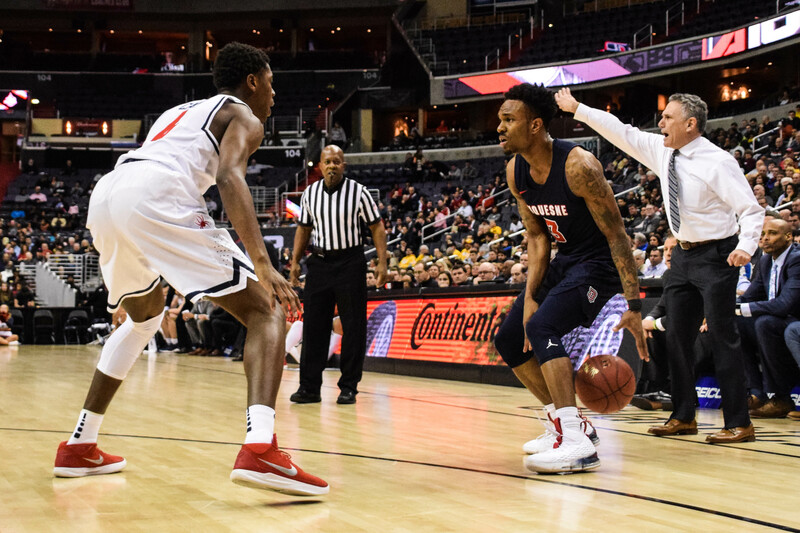 Richmond went on the road to put up an impressive fight against Georgetown and then beat Wake Forest at home. Grant Golden has been absolutely lights out this season. Fordham continues to creep along with a 6-1 record after another 1 point win on Saturday night, downing Manhattan on the road. Freshman Nick Honor and Jalen Cobb continue to play at a high level. I’m looking forward to when this team plays host to Rutgers later this month. They’re 0-8, but La Salle looked much-improved against Villanova this past weekend. That would’ve been one heck of a first win as head coach for Ashley Howard.